Simultaneously occupying past, present, and future, Black Stars escapes the confines of time and space, suffusing image with memory, abstraction with meaning, and darkness with abundant light. In these masterful translations, the poems sing out with the kind of wisdom that comes to those who have lived through war, traveled far, and seen a great deal. While the past may evoke village life and the present a postmodern urban world, the poems often exhibit a dual consciousness that allows the poet to reside in both at once. From the universe to the self, we see Lap's landscapes grow wider before they focus: black stars receding to dark stairways, infinity giving way to now. Lap's universe is boundless, yes, but also "just big enough / To have four directions / With just enough wind, rain, and trouble to last. 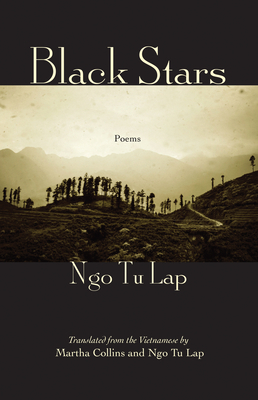 Ngo Tu Lap has published three collections of poetry in Vietnam, as well as five books of fiction, five books of essays, and many translations from Russian, French and English. He has won seven prizes for his writing, which has been translated into English, French, German, Swedish, Czech, and Thai. A fellow of the Korea Foundation for Advanced Studies at Korea University in Seoul in 2010-2011, he is currently Dean of the Department of Social Sciences, Humanities and Economics at the International School (Vietnam National University, Hanoi). Martha Collins is the author of six collections of poetry, most recently Blue Front and White Papers. She has also published two books of co-translations from the Vietnamese. Collins founded the Creative Writing Program at UMass-Boston, and for ten years was Pauline Delaney Professor of Creative Writing at Oberlin College. Editor-at-large for FIELD and an editor for Oberlin College Press, Collins currently lives in Cambridge, Massachusetts. Her seventh poetry collection, Day Unto Day, is forthcoming from Milkweed Editions in 2014.